The argument against? A regular weekly traveler spending an extra half our at the airport in each direction will spend 52 extra hours at the airport each year or more than 2 days each year unnecessarily waiting. My default is to leave home 1 hour and 15 minutes prior to departure. That puts me at the curb at least 55 minutes out. In Austin PreCheck is right inside the main doors of the airport. Even if PreCheck takes me 10 minutes to clear, and American Airlines starts boarding before its published time, I’ve still got a 10 minute buffer if the goal is to be on the plane at the start of boarding to ensure overhead bin space above my seat. I’m not going to stress leaving later, or arriving at the airport later. I don’t have to be first to board, I really just want to not be last so I’m not stuck gate checking a bag. If I leave home 55 minutes out I’ve got a comfortable enough margin. On the rare occasion I’m checking a bag I want to be at the curb just over an hour to departure. If there’s a long line to drop off my bag inside the terminal, I’ll go outside to the sky cap, I can tip a few bucks to check my bag. If there’s a long line for the sky cap that just means a bigger tip..
And at the end of the day if you’ve never missed a flight you’re spending too much time in airports. I’ll only add a larger buffer when it truly matters that I don’t miss that given flight. How early to you head to the airport? Manhattan (Union Square) to EWR I leave 3 hours early. Traffic and EWR Precheck is madness. The more you fly, the better equipped you are to fine tune the answer to this question. My home airport is Denver and it’s a 38 mile drive from my front door, so I’m not usually using an Lyft or van. So I’ve got to account for drive time which can be 45 minutes (usually) or 2 hours (in the snow). Then there’s security. If I’m flying at prime time, I need to give myself 20 minutes, even with Clear and PreCheck. If I’ve got bags, I need at least an hour due to DIA’s crazy baggage systems. Then add 5-10 minutes for the train (depending on which concourse I’m flying from) to the concourse and another 5-8 minutes from the train to the gate. So, an hour is pretty much the bare minimum I’m comfortable with. When I’m flying from another airport, the time I give myself is dependent on how familiar I am with the airport. An hour is perfect for MSP or DTW. 30 minutes is fine for SBA. At ATL, I want 2 hours. The timing of my departure from home depends on the time of day (rush hour requires an earlier departure), if I’m getting a ride (driving myself requires an earlier departure to account for parking and shuttle to terminal), if I want to spend time in the lounge, the size of the airport (larger airports require more time, small airports are great for last-minute arrivals), if I have a boarding pass or need to see an agent, and the importance of the flight. Based upon my limited understanding, don’t you have to pay to get on a new flight if you miss your original flight? If that is the case (and that’s a big if), it’s not feasibly to miss flights for those who pay for their flights out of pocket. I arrived at Austin 57 minutes ahead of departure time after getting stuck behind an accident on the I35 at 5am for 45 minutes (who knew! ), and could not check my bag as they cut off bag checking 1 hour prior to the flight. They refused any leeway way. This was in PAID first class on United. They needed to swap me to a later flight, which then caused me to miss my transfer in IAH and I had to spend the night in Houston till the next daily flight. Suggesting you arrive at an airport with less than 1 hour before your flight is not good advice! My spouse has travel anxiety. We had an 8:30 pm flight out of ATL to LHR. We lived in Tampa, Florida, a 1-hr flight to ATL. Spouse insisted we leave on 7 am TPA-ATL flight, despite my protestations. All I can say is thank God we had Priority Pass lounge access. 1. How important is it that you make that exact flight? 2. How would you be using the time at the airport and how would you be using it if you went to the airport later? 3. How do you deal with anxiety? For me, the answer is almost always to arrive with plenty of time to spare. There is no one time for all flights. It depends on the circumstances. 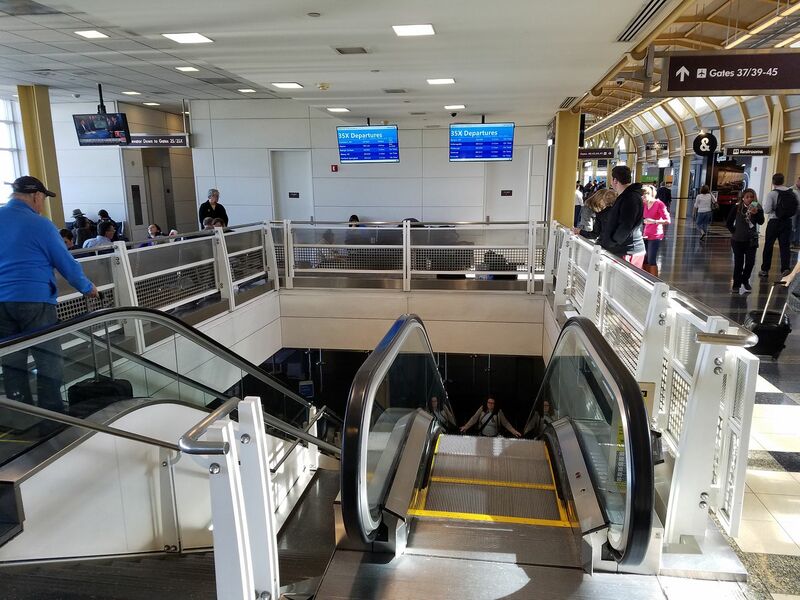 While I sometimes choose to get to an airport 15-20 minutes before scheduled departure; there are also times where I would want to be at the airport 150-200 minutes before scheduled departure. And sometimes I may even want to get to the airport 7+ hours before departure and even stay at an airport hotel overnight. There is no single right amount of time for all times for me. I fly mostly out of LAX. Traffic to LAX is one factor. Traffic on Century around the horseshoe is another. I’ve literally sat for 45+ minutes on a shuttle just to get to T4. In a perfect world with a checked bag I’m there 90 minutes before departure and in the lounge relaxing. If this is an international flight and I have premium lounge access then the answer changes and I’m there 2-3 hours before departure so I can enjoy the lounge. I generally arrive about 45-60 minutes early on balance, though often a little earlier as with WN you have to have your bag checked in no later than 45 minutes even at a small airport or they will tag it “late,” and won’t deliver it. People complain about checked bags, but its rare my bag gets delayed let alone lost. Also I regularly use http://maketraveleasier.com to have my bags delivered on arrival. 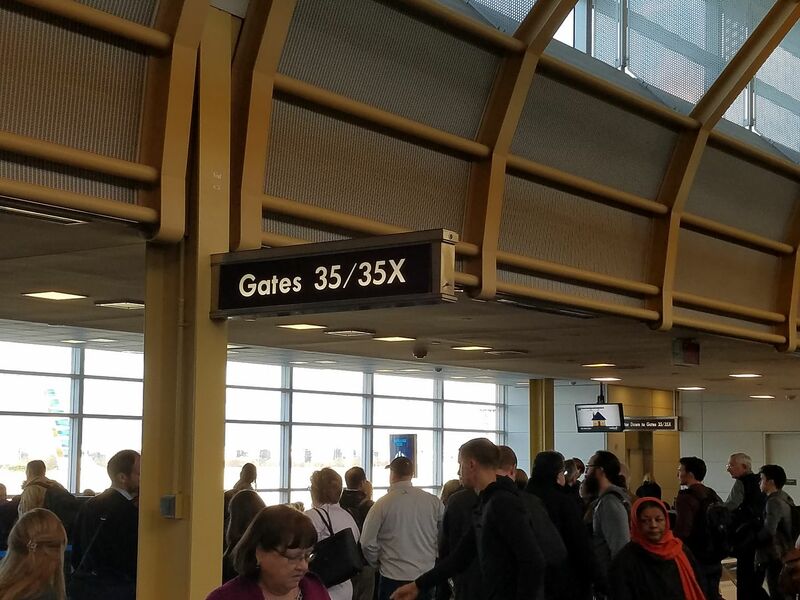 I get it with a large carry on bag, but I’m not sure why people obsess otherwise about getting to the gate at boarding time. If I can, I often like to be one of the last people to board the plane. I don’t want to sit on the plane an extra 30 minutes during boarding. I find if I’m in first I can still get and enjoy a predeparture beverage even if I’m nearly the last passenger to board. Also a lot of people stress about missing a flight. If you miss your flight, 99% of the time, they will put you on another flight for free. Although this may come from confidence and being an elite frequent flyer. My mom got rangled at security, and they tried to charge her $50 to $75 to be confirmed on a later flight. 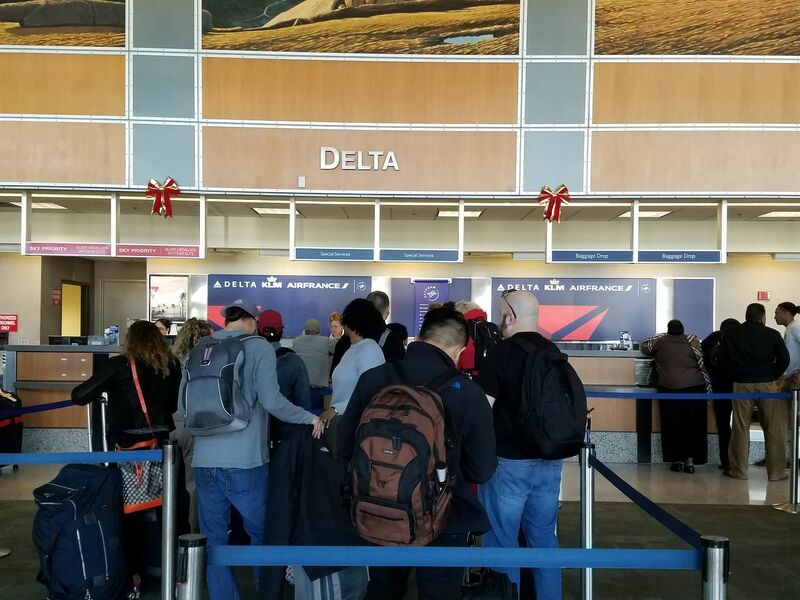 Someone who doesn’t live in AirWorld every week may be tempted to whip out their credit card if that is what the gate agent tells you to do, instead of thinking to ask them to waive the fee under the flat tire rule. I agree with you, you should miss a few flighta year if you travel really often. Also people should try missing a flight just to get used to it if it really stresses you out. Its really not that big a deal to miss your flight. After you’ve missed a couple of flights, you won’t stress as much, and it’ll be old hat. My best story is arriving late for a BOS to DCA flight, last flight of the night. They closed the door 15 minutes early (pet peeve) and the gate agents were in the process of starting to rebook me for free for the next day. Then the captain, seeing me through the window, called operations by radio, and told them he wanted them to re-open the flight to let me on. Even after re-opneing and attaching the jetway, re-printing the new paperwork, etc. I think the flight still showed an out time 1-2 minutes early from scheduled departure! A real pet peeve is this business of closing the door 15 minutes early. At least with WN, they give you 10 rather than 15 minutes, so you can comfortably show up 10 minutes before departure and the door will be open. DL shuttle might still be good in this way too! I think this business of closing the door 15 minutes early is just a way for the airlines to pad their ontime stats. AA’s infamous D0 procedures still result in a lousy operation overall, so its not like its significantly improving reliability. I don’t think in the 90’s the airlines closed the door 15 minutes early, and I don’t think this practice has improved the passenger experience at all. I used to board in the 90’s 5 minutes before published departure time regularly, and life was good! My home airport is MSP, and I try to get to the airport at least an hour before flight time. That usually leaves us sitting at the gate for about half an hour, but I’d rather do that than be stressed. 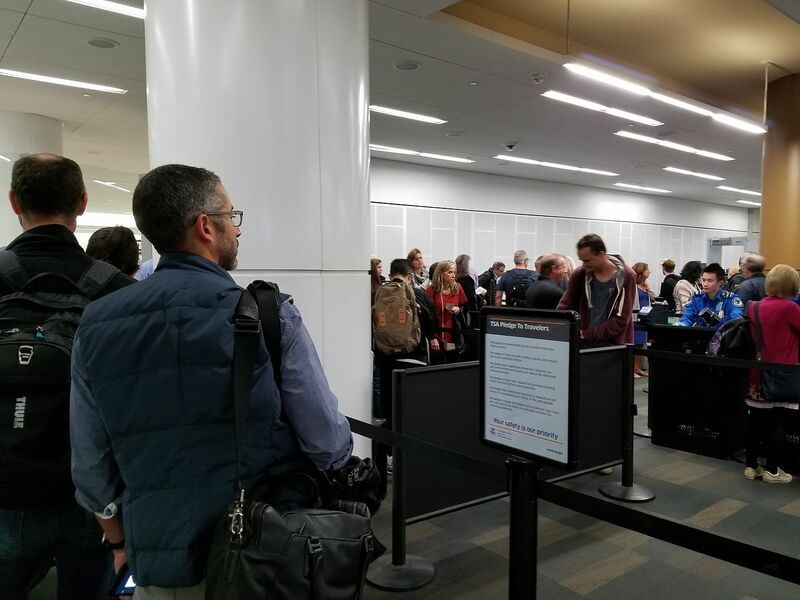 My husband has some mobility issues and has to be wanded through security due to metal and electronic body parts, so the amount of time it takes us to get to the gate is a little unpredictable. Security line length seems to vary a lot here, possibly because this is a Delta hub. I’ve been reading that hub airports try to cluster flight and arrival times together, which leads to peaks and valleys in traffic levels throughout the day. Do you take that into account in your calculations? I used to be like OJ, happy to get their 5 minutes before the gate closes. Now my primary hial is to keep my blood pressure low. It’s a different story outside big airports, but LAX, MIA, JFK all are obstacle courses with an airport at the end. And yes, I’ve missed a flight. If with my family drop at curb, skycap, they clear security while I park the car. 2hr15min leave home. If alone and no bag check 1hr35min leave home. If you miss an international first class flight because of a missed connection you could be out $15,000 or more – I’ve got lots of friends who’ve had to pay this much!! Playing “chicken” with your flight is idiotic. I like to get there hours early and head for the lounge. I’ve only missed a flight once due to cutting the time too close. It was a mid-afternoon flight, but turned out to be the last flight of the day to my destination out of SJC (San Jose). But SFO had flights into the early evening and was only 50 miles away! Thus began a “Planes, Trains, and Automobiles” type adventure, ending with an unplanned night in an airport Marriott. Fortunately this was a business trip, so my expense account covered it, and there was nothing exciting waiting for me at the other end of the flight, so no big loss. But it would be a crappy way to start a vacation. I usually clear security 1.5 hours before my flight out of DTW and that gives me time for a one mile + walk from end to end in the McNamara Concourse A so I’m nice and limber before I board my CRJ200 for ABE! Overbooking could see latest arrivals dumped. Also an unexpected road closure could leave you trapped in a traffic jam for ages. I’m sitting in my office or sitting in a lounge or at the gate. I’m on my computer in either place. The ride to the airport is often shorter if I leave earlier (see, evening flights). There is no time “wasted” by arriving earlier. Now, __boarding earlier__ is another matter. I take the subway to JFK. I have to connect. The trip could take 1 hour or 2 hours. I have been at the JFK, at Jamaica, waiting for the Airtrain going to the terminal. It was delayed by 30 minutes. Yea, I leave early. I plan to arrive 1.5 hours before the flight. So far, I have not missed a plane, but often I am there just 30 minutes before boarding. LGA is easier, because it is a cab ride (if I can find a cab) or Uber. Always good to be @ the airport ahead of time. Accepting you and most of your readers are US based, not everyone is. Also I surmise many of your readers flight are within the US or Canada. I however live the other side of the pond in the UK and am always flying internationally. OK, some are around Europe, but many are transcontinental and then link up again with another flight. Not missing that first flight can have dire repercussions in today’s unforgiving world. Traffic is surely the killer wherever you are in the world if you are starting from a major hub (LHR!). That’s why I ensure have elite status. Fast Track! I hate to say it but only in the US is there such a chaotic (and I am being polite) security set up. Ne? Give yourself the time. Get there early. Sit in the lounge. What else would you really do with that hour even if it does add up to 2 days in a year. I lose more time on many other useless events that that. This topic is always a crowd pleaser. My home airports are SFO and OAK. I try to time my arrival to 1 hour before domestic flights and 1.5 hours for international flights. With CLEAR I am through the checkpoint in <5min leaving a reasonable cushion for unforeseen traffic (though I try to check google maps to anticipate and address those issues). In practice this means I usually get a few minutes to grab a snack at a United Club, and occasionally even a meal at a PP restaurant. If I am parking off airport then I add 20 min to travel time for the shuttle. And if I have to travel during rush hour then I may add additional cushion. My biggest pet peeve are the rare occasions when I can't print my BP and am forced to do airport checkin. I absolutely hate the uncertainly of the lines particularly for domestic. So what I am suggesting is it depends on individual travelling. The best advice is to arrive when the airline suggests you should arrive. “And at the end of the day if you’ve never missed a flight you’re spending too much time in airports” – Don’t really follow that logic. I’m always there early. When flying out of the home airport, I always get there quite early and will enjoy time in the Admirals Club, Centurion Lounge or SkyClub. Never know what traffic will be like, nor parking at the airport. I’d rather be there early and prepared to ease the tensions as traveling is a tense enough thing to begin with (even though I enjoy it). I even like planning connections that have a good enough time to layover. For domestic connections I generally insist on a 2 – 3 hour connection. Internationally particularly in places like LHR, it’s a minimum of 3-4 hours. Way too many things can go wrong and there should be a buffer built in. Recently I flew from MUC to PHL with a 2 hour connection. Upon arrival which was early, but having to wait for a gate, then a long walk to immigration, baggage/customs, re-check, security again then walk to the gate there was all of 10 minutes to spare before boarding. Some folks might say that’s great as it was right in time. Far too close for me! Way too many things can go wrong and I’m a planner so like to plan for things to go wrong so that alternate plans work well. Having a buffer gives a sense of relief. For the added time there, I’ll either take a nice brisk walk through various terminals or sit to myself in the club or sometimes people watch. I do not ever see it as wasted time to be there early. Missing your flight really depends on your ticket and where you are. Maybe in The US it’s okay, but having been based in both UK and Asia, I don’t recall ever having a ticket which allowed me to miss my flight without having to buy a brand new ticket! I’ve been at both ends of this spectrum, and for me, earlier is better and more relaxing. I used to cut it close, but found it raised the stress level too much. And I have missed flights, including an important personal one, in that case due to traffic. But I got tired of running through airports and all the stress, and changed. I’m with the poster who said their goal is reducing stress. Now, I get there pretty early, walk – not run – to the lounge (I am usually flying out of a large airport with some pretty nice international lounges), and work on my laptop. And I also usually try to get to the gate just as boarding begins. I have status on most of the airlines I fly and usually swing an upgrade one way or the other, board early, have space for my carryons, get situated, have a nice PDB, and work on the emails till the door closes. Anyway, I don’t find I am losing any more productivity by getting to the airport or boarding early. And working in the Concorde Room is not awful. Flying can be miserable. I try to make it less so, sometimes even pleasant. Because my big trips are vacations and I get my ff mile business flights a year in advance, I really don’t want to miss my perfect flight on the best airlines and find myself using more miles for a middle seat in economy. I don’t even trust domestic airlines in some countries to always fly, so I will even give myself a couple of extra days safety. I’ve learned my lesson. Don’t take what the airlines consider the “best” connections when looking at awards travel. Keep going until you find the flights with the three or better four hour layovers, and as some have said, go to the lounge. I think the author of How Early Should You Get To The Airport is crazy. if you’ve never missed a flight you’re spending too much time in airports? I PAY for all my flights. Also, I want to get where I am going at the time I originally planned. 52 extra hours at the airport each year? So what! The author never wastes a minute of their life? I enjoy my time waiting. Reading the newspaper, or a book. People watching. Just relaxing for a bit. Etc. What type of high pressure life does the author live that they can’t “waste” 52 hours a year relaxing? I became a million miler years ago, and I have never missed a flight other than a late connection. I have also never felt like I suffered being at the airport early.